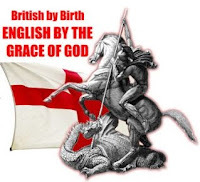 Left wing think tank, IPPR, has produced a follow-up to the one released in January 2012 which documented the rise in English identity and warned that ignoring the disadvantages that England faces as a result of asymmetric devolution would threaten the union. This time, though, they have included questions on the EU and the correlation between euroscepticism and the English identity and made a surprising (for them) discovery: the party that most people believe will stand up for England's interests is UKIP. The latest report finds that the rise in English identity at the expense of British has held up against the onslaught of state-sponsored British nationalism during the Olympics and the royal wedding. English remains the dominant national identity in England. The correlation between euroscepticism and national identity is very interesting - over half of people who identify as English more than British are in favour of leaving the EU but only a third of those who identify as more British than English are similarly minded. There is also a direct link between euroscepticism and dissatisfaction with England's treatment in the British union post-devolution. A massive 91% of people who think we should leave the EU think that MPs elected in Scotland shouldn't be allowed to vote on English matters and 71% think that the British government can't be trusted to look after England's interests. 21% of English people think that UKIP is the party that can be most trusted to stand up for England's interests - the first time none of the above hasn't topped the poll. Only 1 in 5 English people support the current form of government and 78% of English people (eurosceptic or not) think that Scotland should pay for services out of their own taxes. More UKIP supporters identify themselves as English more than British than any other party - 55% of those polled. They are also the most dissatisfied with the status quo with 49% supporting English independence. Surprisingly, only 90% of UKIP supporters want to leave the EU. Given the choice of local government, Westminster and the EU, 31% of English people think the EU has the most influence over the way England is run. This is by far the highest percentage anywhere in the EU - Brittany, Upper Austria and Galicia are joint second with only 9%. England , as opposed to the UK, is without doubt the most eurosceptic country in the EU. It's time for UKIP to accept that the majority - in fact, almost all - of the party's support is in England. Almost every elected representative the party has was elected in England. The Scots aren't eurosceptic -only a third of all Scots are in favour of leaving the EU and some of those are pro-independence so would never vote UKIP. We are the party most trusted by the English to represent English interests. You don't have to be a genius to realise that UKIP's future is in England and leading the call for fairness and equality for the English. The first step should be to finally draw a line under the ridiculous anti-devolution policy that has been losing us votes for years and start promoting an English Parliament.